We are a recognized trader and authorised dealers 'Dowty' of a wide range of Dowty Gear Pumps. Our products are acknowledged for their attributes like easy installation, low power consumption, light weight, minimum maintenance, corrosion resistance, perfect finish and durability. Owing to these features, our products are used in automotive & defence sectors and agricultural equipment & construction equipment industries. 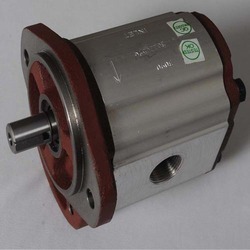 Further, the gear pumps are used in hydraulic applications. Owing to our years of experience, we are able to offer a wide array of Gear Pumps to the customers. The products offered by us are in strict compliance with the global quality standards. We offer these products in various specifications to our clients, spread across the globe. We are instrumental in offering a wide array of Gear Pumps to the clients. These products are available in varied wattages and other specifications in the worldwide market. We are engaged in offering a comprehensive range of Gear Pumps to the clients. Our customers can avail these products in different specifications from us. Dynamatic® has a complete range of gear pumps for both mobile and industrial market segments. Dynamatic® developed these pumps in technical collaboration with DOWTY Hydraulic units Limited, U.K.
Dynamatic® gear pumps are available in four frame sizes giving displacements from 0.80 cc / rev. to 151.33 cc/ rev. Pumps are also available in Tandem Configurations and the company specializes in supplying units to special order instructions (subject to quantity) including multiple section pumps. cc / rev. to 151.33 cc/ rev. Looking for Dowty - Gear Pumps ?